РИМ. ВАЛЕНТИНИАН II (375-392 г.) АНТИОХИЯ. АЕ4. Я согласен с правилами аукционов и покупаю лот за 16,50 бел. руб. 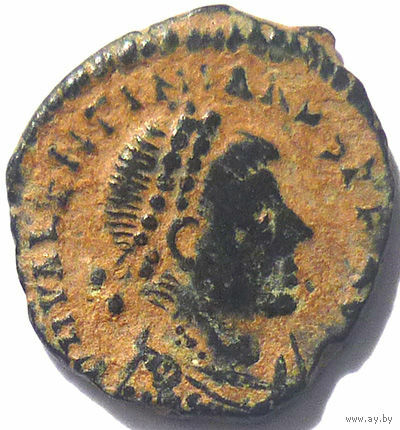 Valentinian II. AE4. 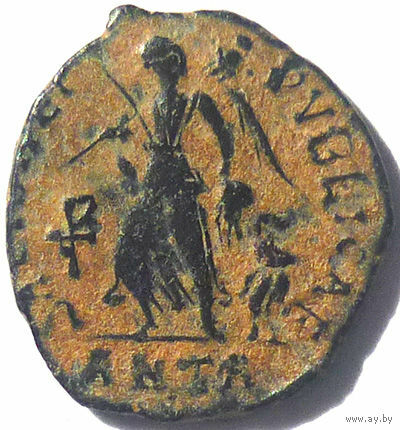 388-392 AD. DN VALENTINIANVS PF AVG, pearl diademed, draped, cuirassed bust right / SALVS REI-PVBLICAE, Victory walking left, holding trophy on shoulder and dragging captive beheind her. Chi-Rho in left field. Mintmark ANTA. 12-13 mm.